#InstaKC Captures is a blog series that highlights some of the most photogenic sights in Kansas City. From iconic monuments to lesser known gems, we tour the city in search of some of the best places to take a snapshot. In honor of National Barbecue Month, May's installment of #InstaKC Captures pays tribute to our city's signature cuisine. As ubiquitous as they are beautiful, the city is teeming with fountains large and small, from simply designed pieces to works of complex art. Part celebration of the city’s rich Irish heritage, part full day of fun for many in the metro, St. Patrick's Day in Kansas City is a holiday not to be missed. We added #VisitOP to our #InstaKC Captures series when we visited the Museum at Prairiefire, a stunning architectural achievement in Overland Park and one of the most striking sights in the entire metro. The Old Red Bridge in Minor Park is a historic landmark south of Downtown Kansas City—and one of the most romantic spots in all of KC. Bring a lock and someone special and head south to grab scenic shots of love eternal. The Roasterie Factory Cafe is home to the most photographed airplane in all of Kansas City. Not to mention the free daily tours, which showcase the coffee production process, from cupping and roasting to blending. One of the many architectural monuments in Kansas City, Union Station boasts plenty of holiday spirit to go around. Towering at more than 100 feet tall, the Mayor's Christmas Tree at Crown Center is one of the most impressive seasonal sights in Kansas City. The Nelson-Atkins Museum of Art is famous for its supersized Shuttlecocks and photogenic landscape. But, as it turns out, there's more than meets the eye when it comes to the art on the museum's grounds. Offering one of the best views of the Kansas City skyline, the Rosedale Memorial Arch is a memorial originally dedicated to the men from the Rosedale neighborhood who lost their lives in World War I. A giant spider! A crying giant! 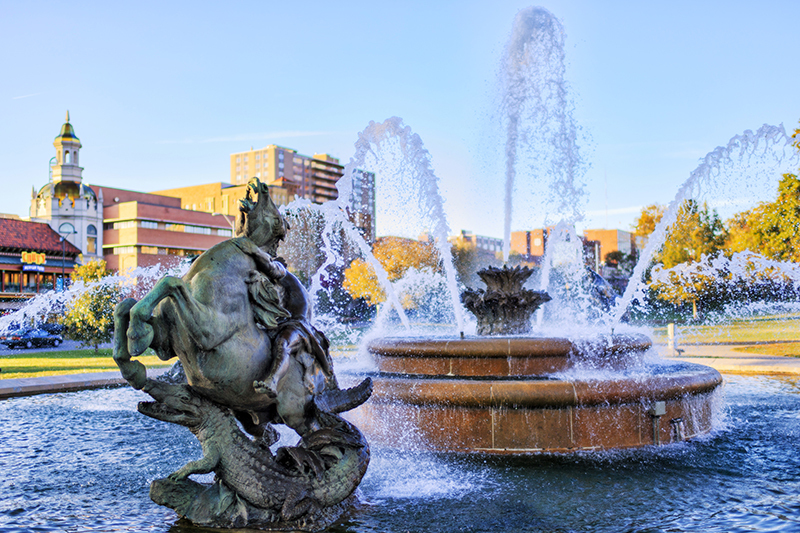 Tap into your imagination with shots around the free museum of contemporary art, right off the Country Club Plaza. Eclectic and unexpected, this East Crossroads hidden gem is home to an ever-changing array of top-notch graffiti art. Regardless of the surface, artists bend and twist the urban canvas to fit their vision, making for a truly photogenic site totally beholden to the culture of Kansas City. Beautiful and photogenic, Liberty Memorial serves as a reminder to us all the sacrifice of the men and women who gave their lives in the Great War. It's also one of the best places in all of Kansas City to view the downtown skyline.